Memorial Day Archives - Pebbles, Inc.
Hello Pebbles friends! 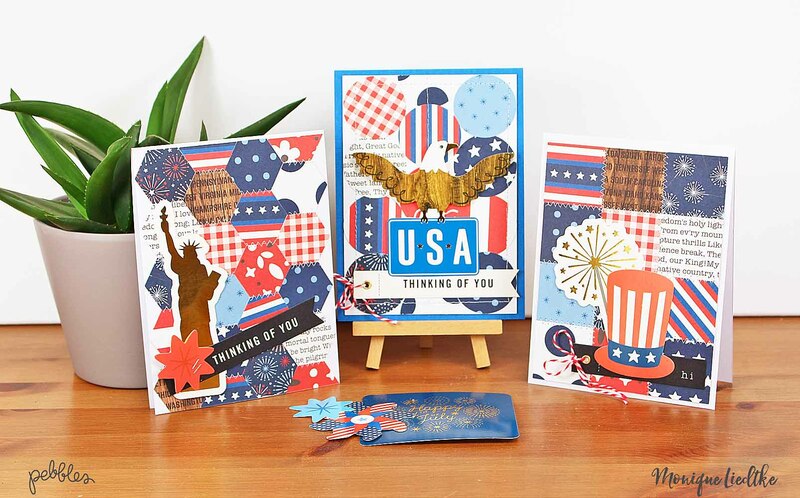 It’s Monique here today, sharing a set of Memorial Day cards using the “America the Beautiful” collection. 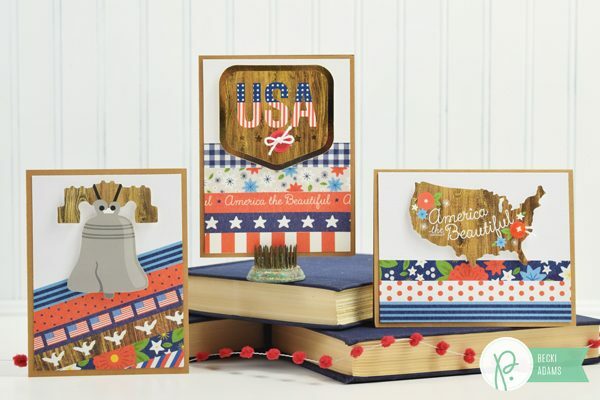 I had such fun creating these cards! 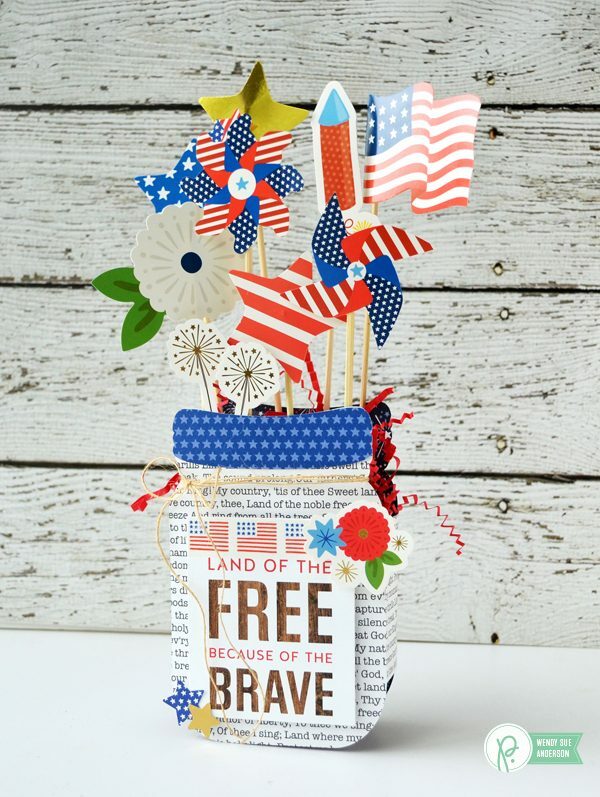 Although we don’t live in America, we have a lot of family & friends living there who we can send these Memorial Day cards to. 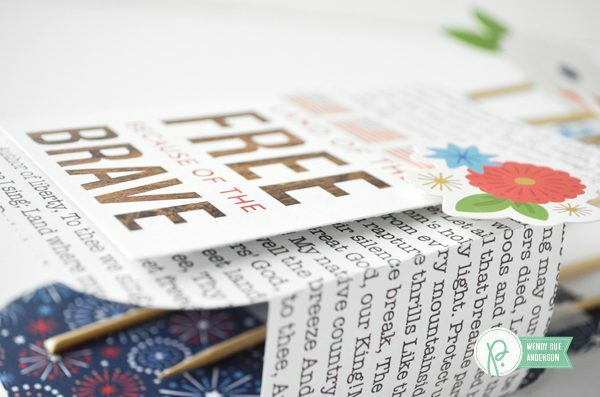 Here are the Memorial Day cards I made. I decided to go for a kind of “quilted” look and used my square, circle, and hexagon punches. 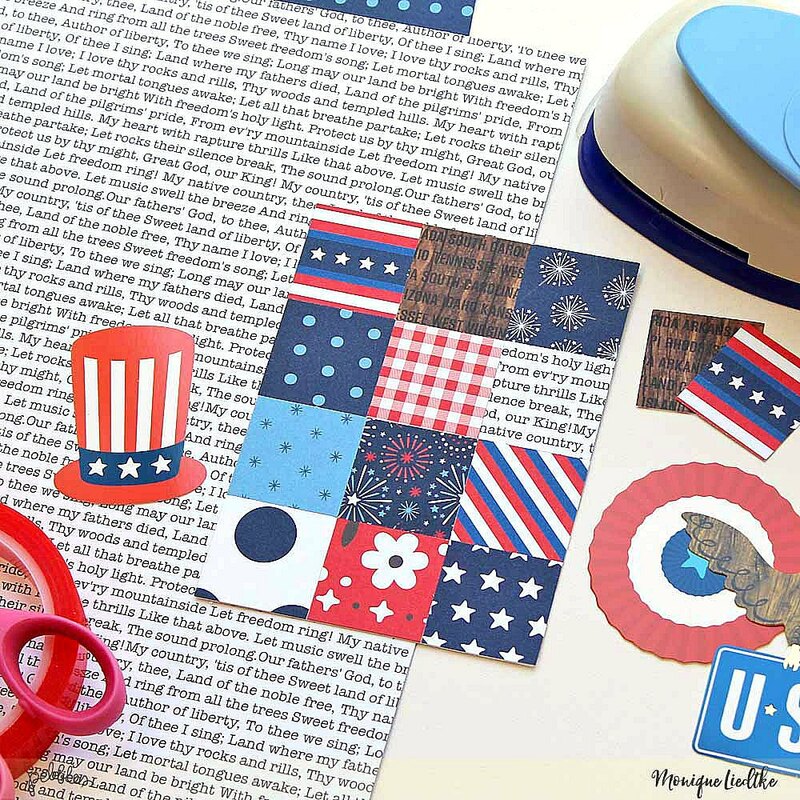 After deciding on the punches, I made a selection of the papers and die-cuts I thought I would use for the Memorial Day cards. 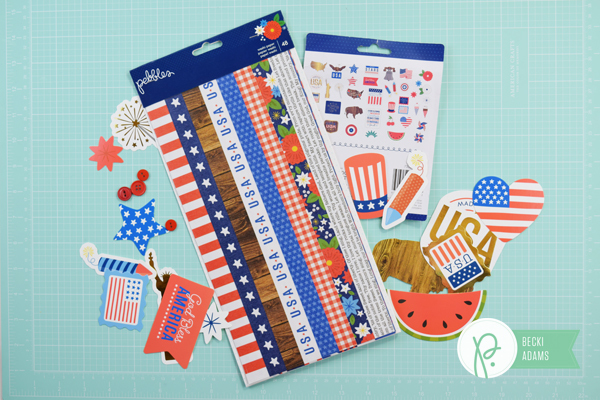 There are so many awesome papers and die-cuts that I had trouble choosing! 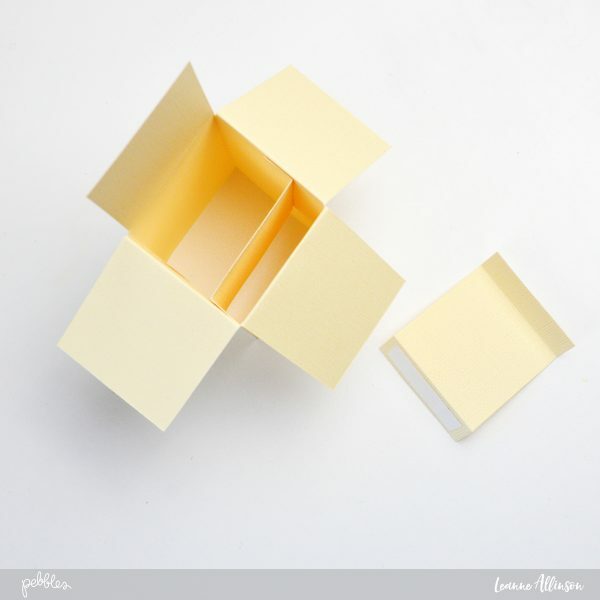 The card with the 1.5″ squares was the first card I created. In the end I used 7 (!) double-sided sheets of paper from which I punched 12 squares, which I then adhered onto an (extra) piece of white cardstock. Because I wanted to use my sewing machine and stapler, I decided on using this extra piece of cardstock which I adhered on a cardstock card base later-on. The finished cards all measure 4.5″ x 6″, so the extra cardstock pieces I used to glue the squares, circles and hexagons on are a little bit smaller. 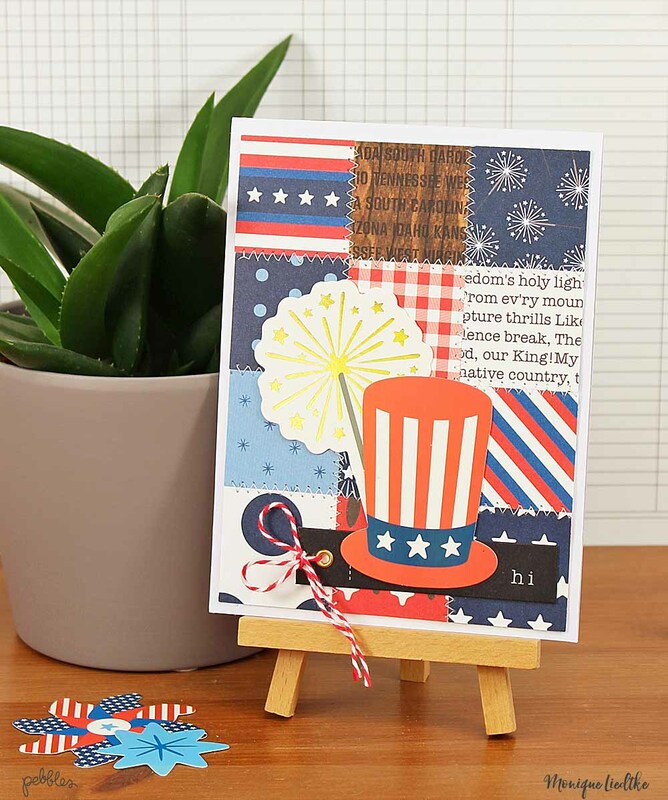 If you are planning to create some cards for Memorial Day as well, then I hope I’ve been able to give you a bit of inspiration. 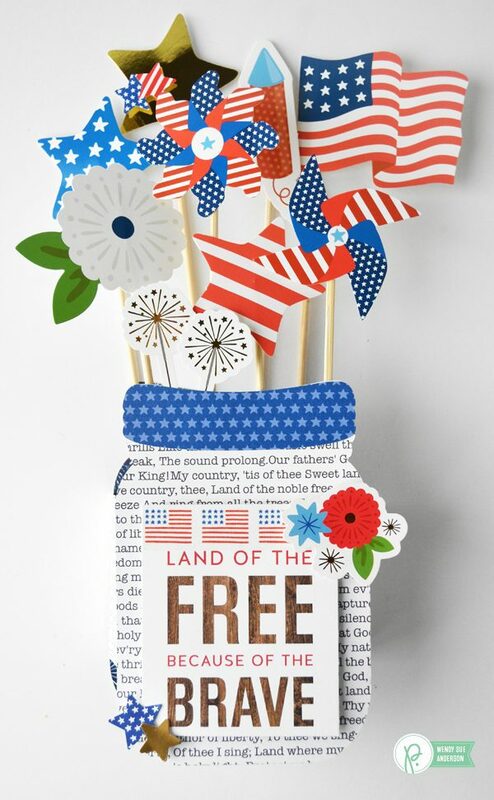 Wishing you all a peaceful and beautiful Memorial Day! Hello Pebbles Friends! 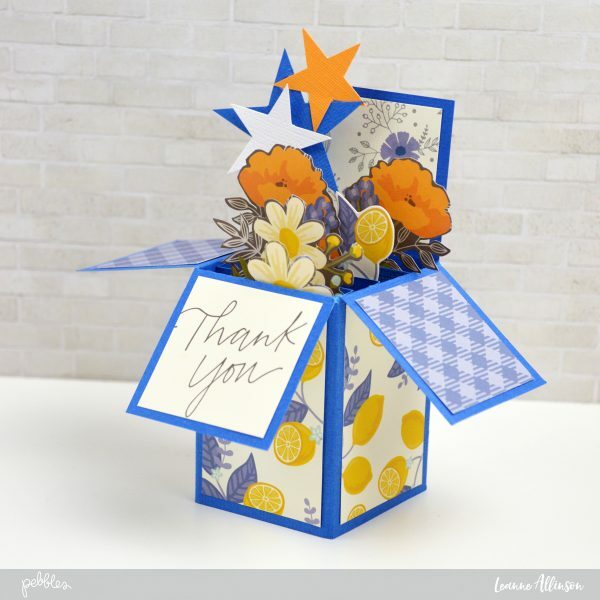 It is Leanne here today, sharing a pop-up-box card or card-in-a-box tutorial. 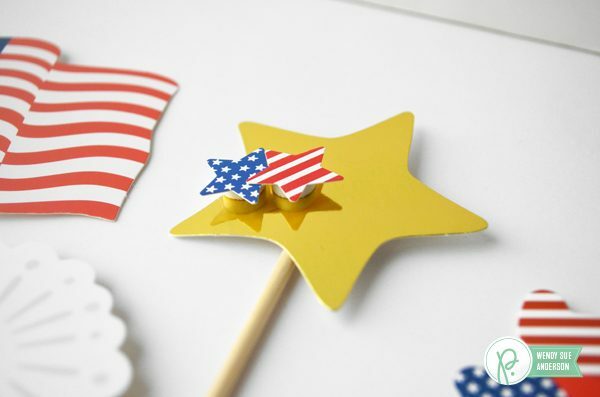 This week on the Pebbles blog we are recognizing Memorial Day and similar practices from our own country of origin. 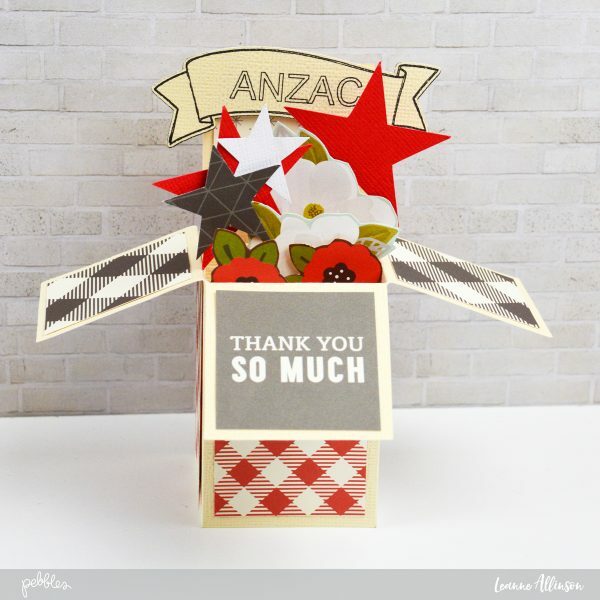 In Australia, we thank our service men and women traditionally on ANZAC Day. 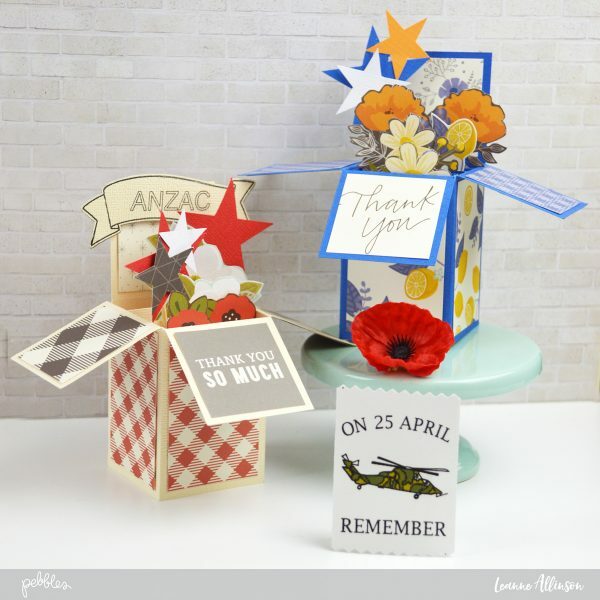 ANZACs (Australian and New Zealand Army Corps) are remembered through the use of red poppies and adorn many memorials to commemorate those that have fallen. 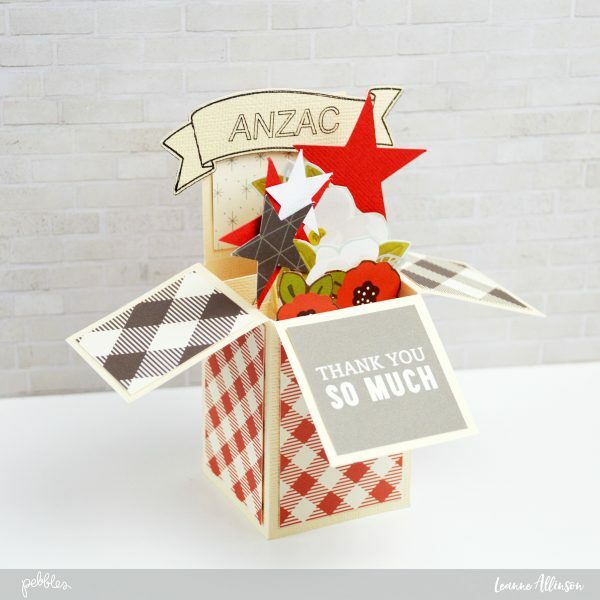 My pop-up-box card today reflects the traditions that we follow in Australia, but this design can be altered or embellished to suit your own personal needs. step 1. | Box base: Trim cardstock to 8.5″x5″. Score a fold line at 2″, 4″, 6″ and 8″. Score a second line at 2″ from the top. Using sharp scissors, trim along the score lines from the top but only to the second score line. See image below. 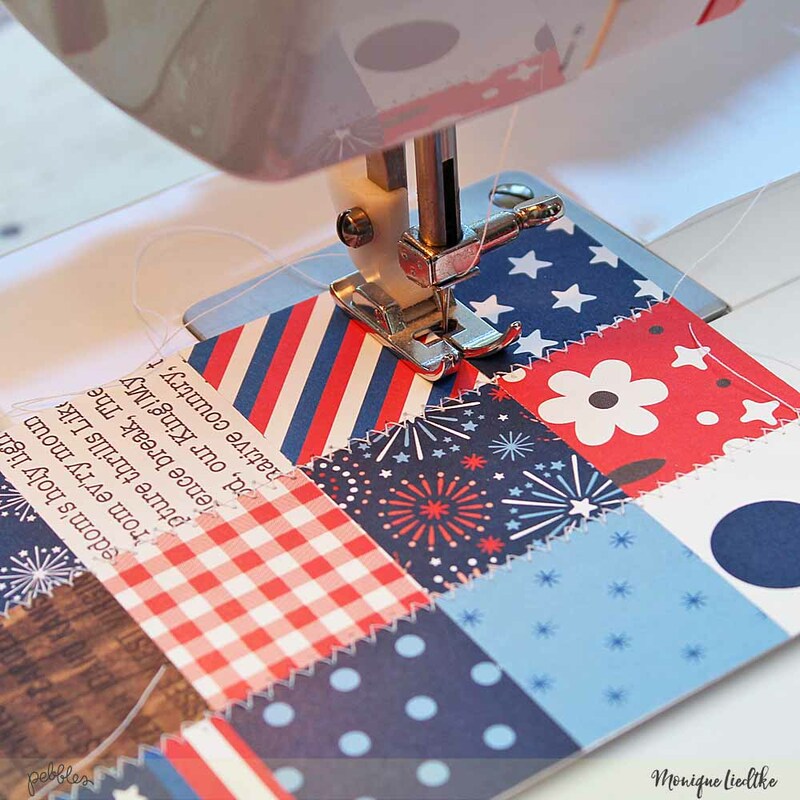 Trim a small triangle section off the 1/2″ fold/tab on the right side. See image below. 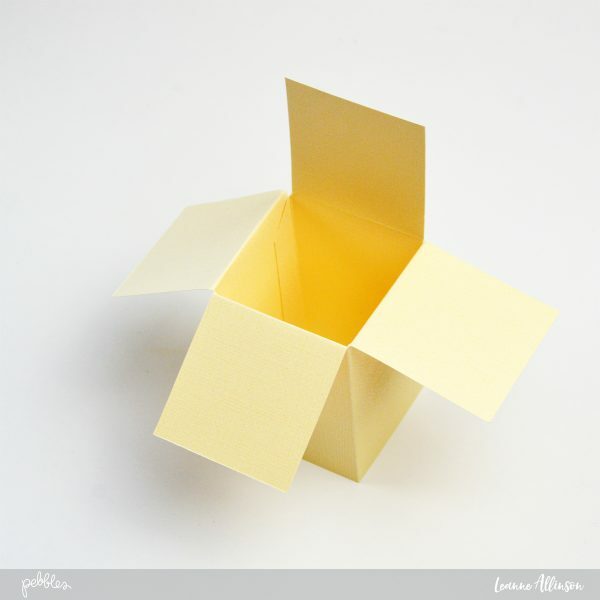 step 2 | Fold: Carefully construct the box shape, applying double sided tape to the 1/2″ section to secure the box together. Determine which panel will be the back of the card and leave the score line unfolded (the flap stays upright). 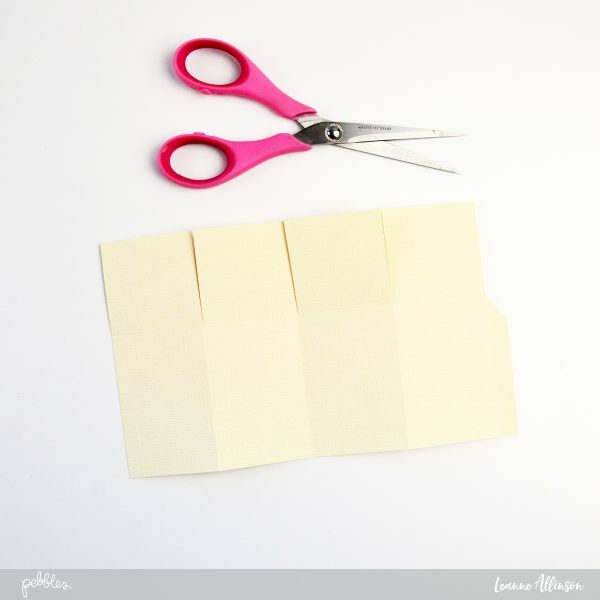 step 3 | Inserts: Trim two (2) pieces of cardstock to 3″x2″. 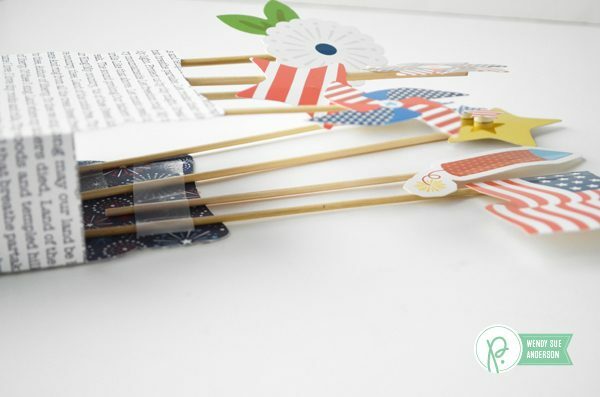 Add a score line 1/2″ from the each end and fold in opposite directions. 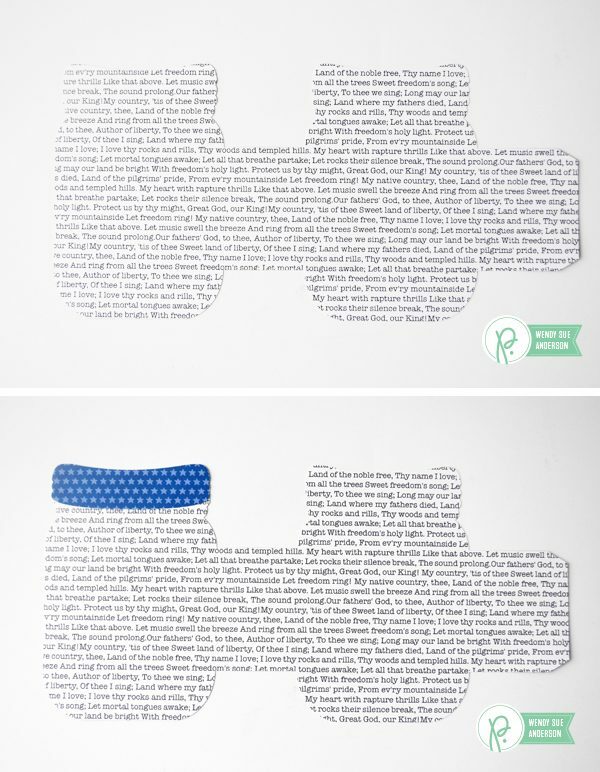 Add lengths of double sided tape. 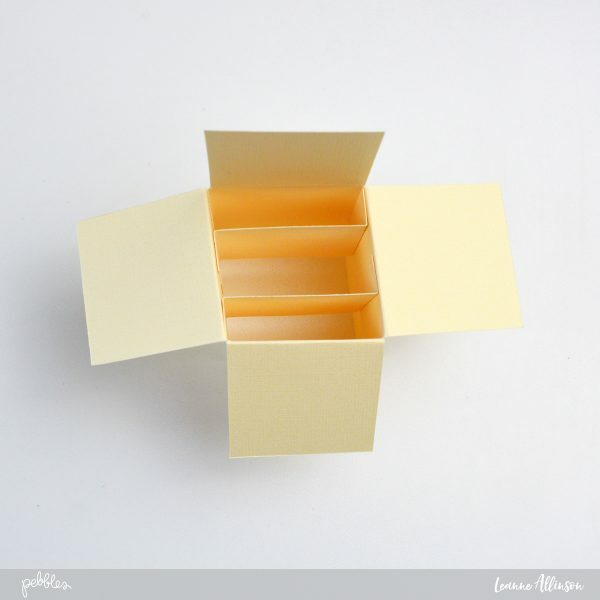 step 4 | Inserts: Carefully insert the cardstock supports into the box. See image below. step 5 | Embellish: Trim coordinating patterned papers to panel sizes – 1.75″x4.75″ (back panel), 1.75″x1.75″ (front back panel), 1.75″x1.75″ (front and side flaps, plus same again for reverse side/underneath panel), 1.75″x2.75″ (lower box front and side panels). step 6 | Star embellishment: Trim three (3) different size stars from patterned paper or cardstock. Mount onto a toothpick with hot glue and foam tape. Secure it to a box insert with hot glue. step 7 | Embellish: Fussy cut flowers, blossoms or other embellishments from coordinating papers. Add a sentiment either to the front panel of the box or on foam tape on the front of the back panel. Hello everyone! Eva Pizarro here, bringing you a quick gift — pinwheel gift boxes — inspired by our week’s theme: Memorial Day. In Chile we don’t celebrate Memorial Day, but our flag colors are also red, white, and blue! 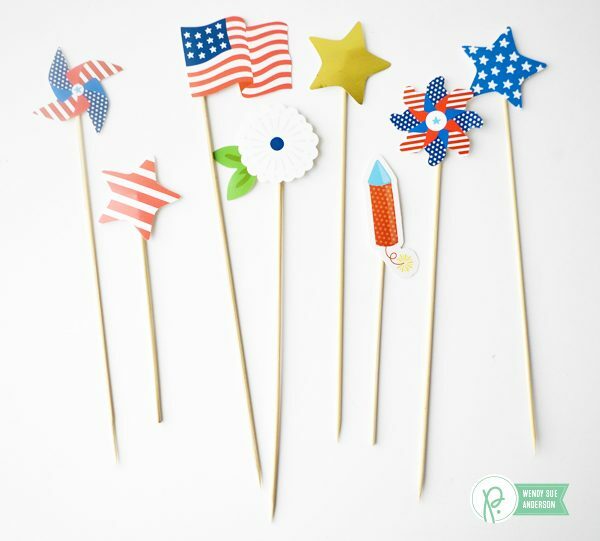 I thought I could make some pretty party favors for our next independence day celebration. 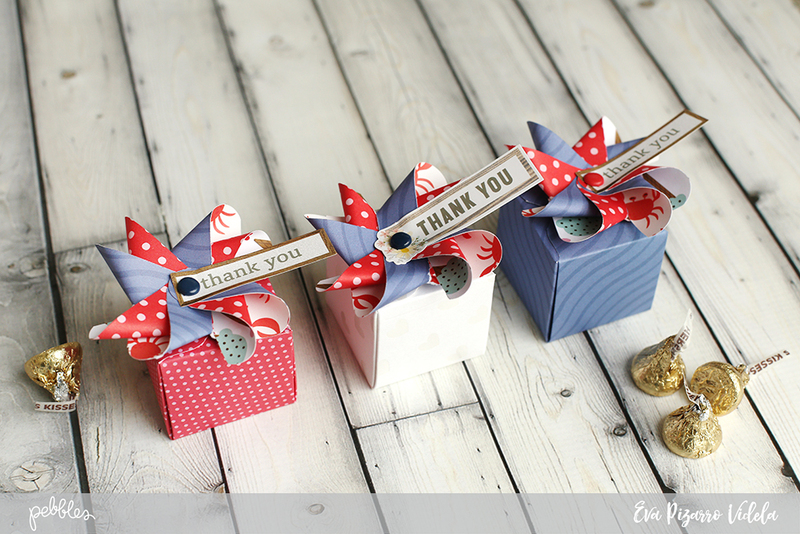 To make the pinwheel gift boxes, I used two punch board by our friends at We R Memory Keepers: The Pinwheel Punch Board and the 1,2,3 Punch board and some red white and blue supplies by different Pebbles’ lines. 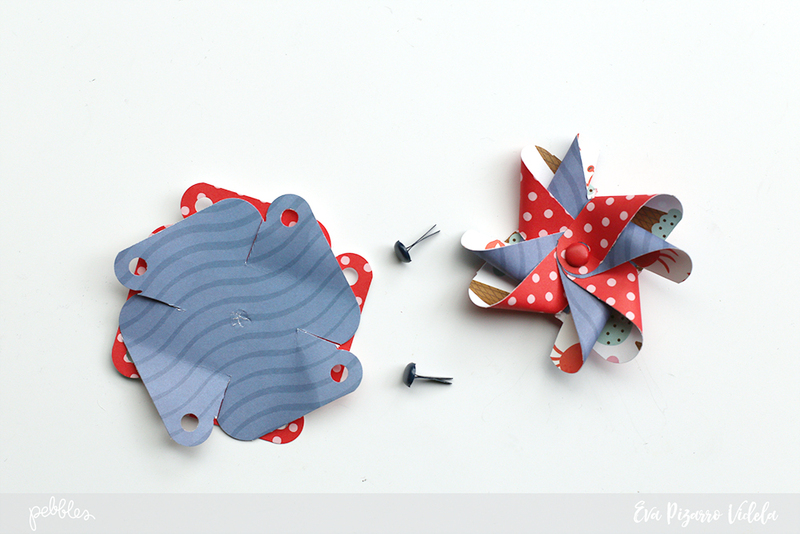 My pinwheels are 3 inch wide and doubled. Just follow the board instructions, it is very easy! 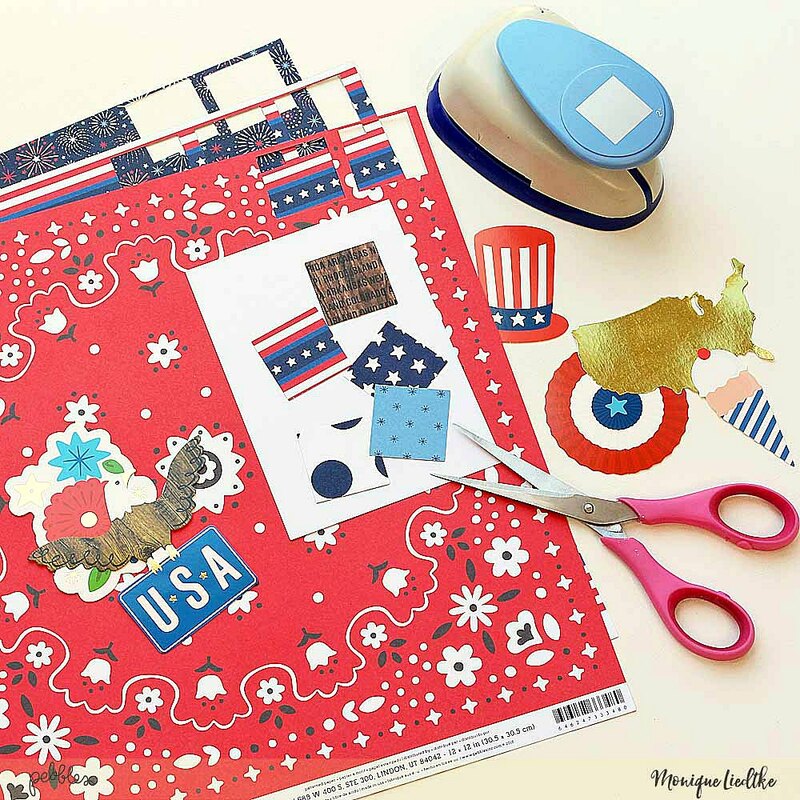 The blue paper I used is from the Sunshiny Days collection, and the red one is from our last Valentine collection, My Funny Valentine. 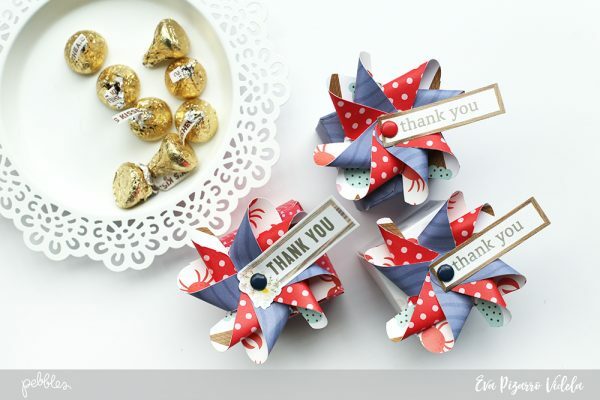 I held my pinwheels in place using blue and red brads. 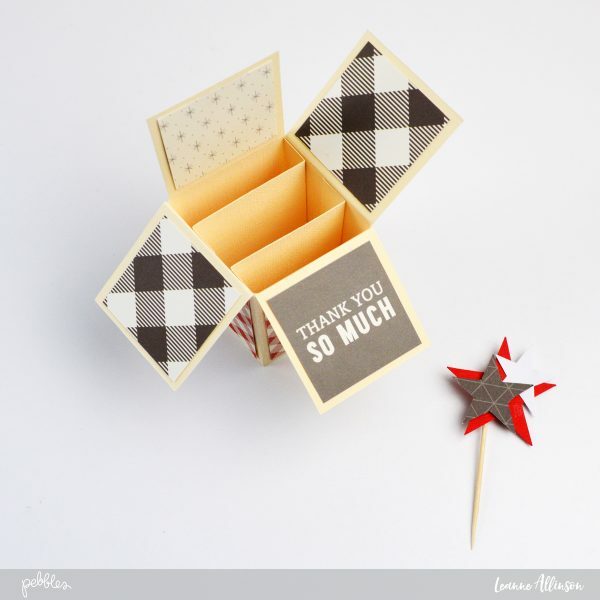 As sentiments, I used the “Thank You” stickers found in this Simple Life booklet. 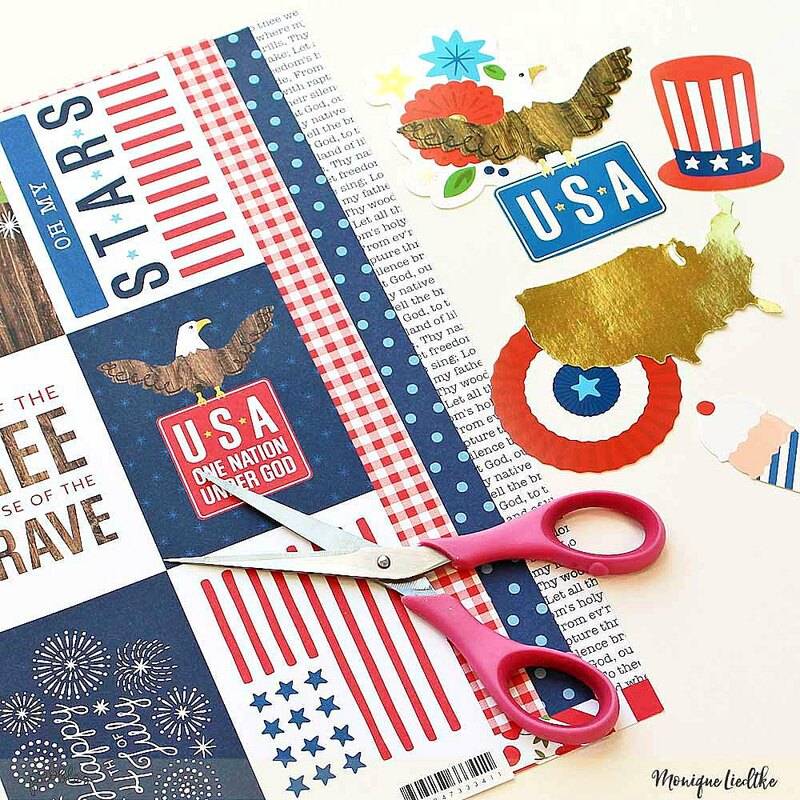 You get 42 stickers in this booklet and it is perfect for card making! I created the boxes with the 1,2,3 Punch Board, using the same red and blue papers. 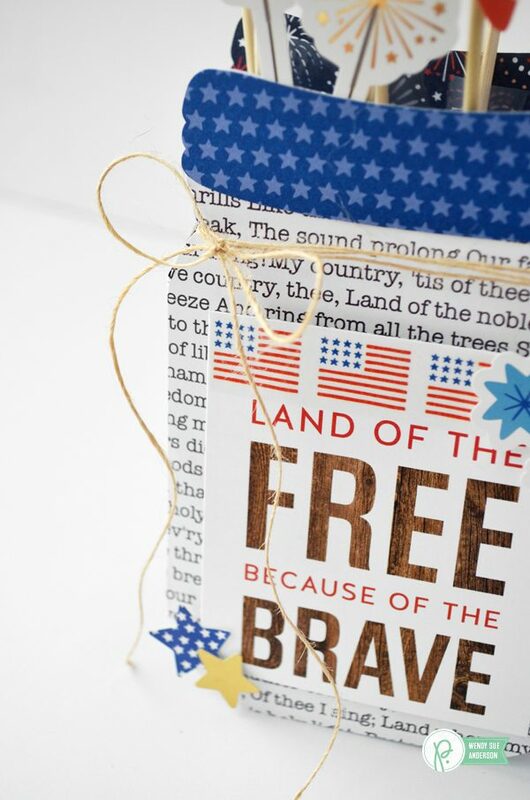 The white paper has tiny hearts embossed and it is from our sister brand, Bazzill Paper. 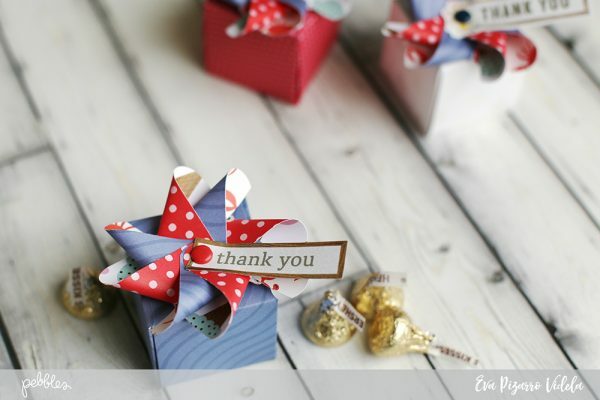 I filled the boxes with chocolates and glued the pinwheels on top. 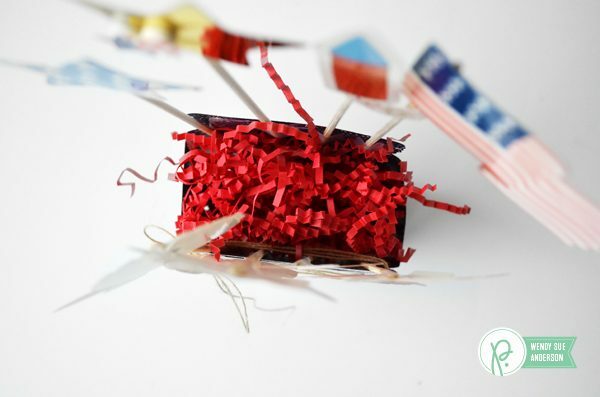 These pinwheel gift boxes are quick to make and can be used as gift for the families of those who lost their lives serving the country during this Memorial Day, or also as a 4th of July party favor. 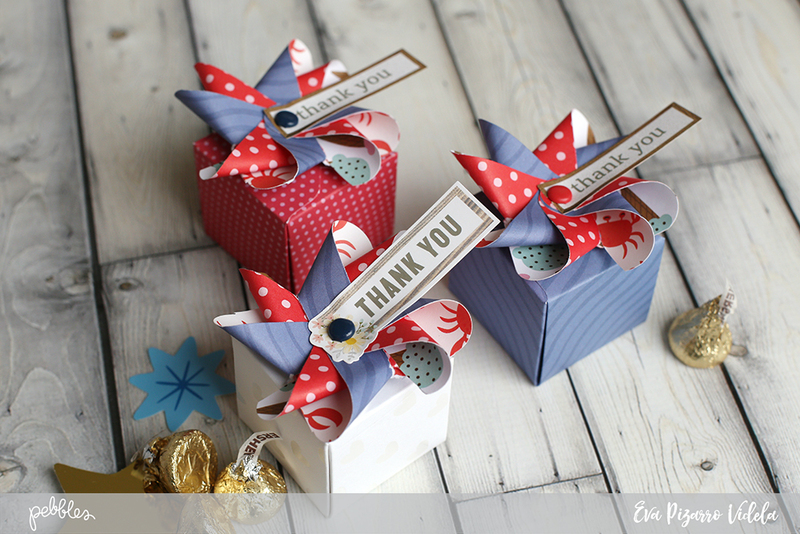 You could also include a little thank you or love note inside the pinwheel gift boxes. I am sure the families would really appreciate it! 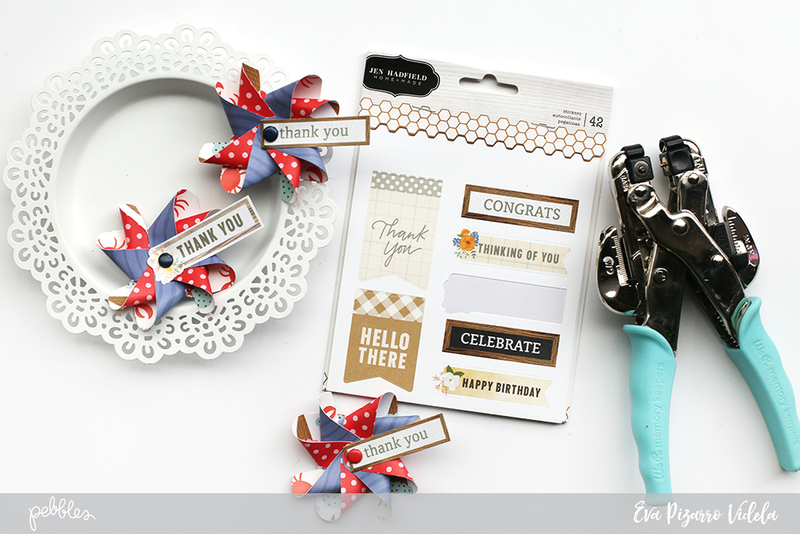 If you want to add additional stickers or embellishments on some of the images, do that now. I like to use foam adhesive for this part. 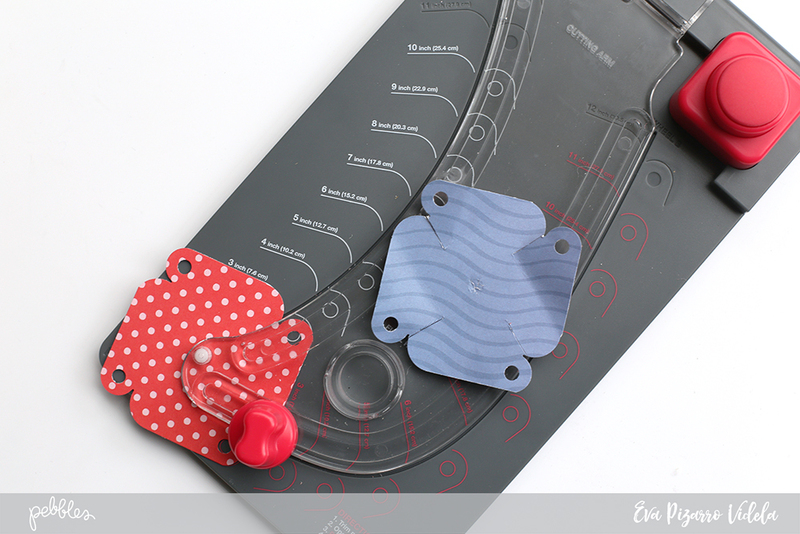 Add additional stickers here and there – use foam dots for dimension! And that’s it! Now you can gift this sweet little decoration, or display it in your home with pride! Hey friends, Becki here. 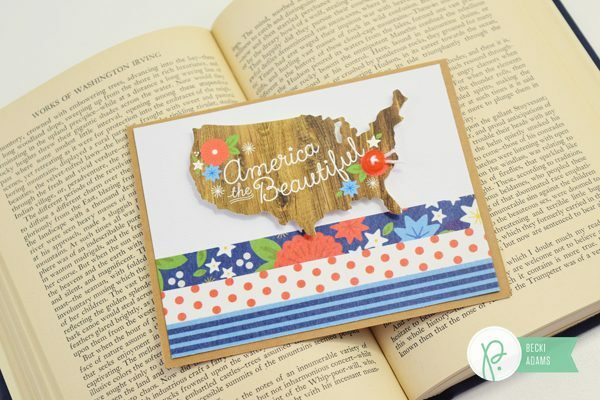 I’m so excited to share with you a set of cards I created with the brand new America The Beautiful collection (you can read more about the collection HERE). 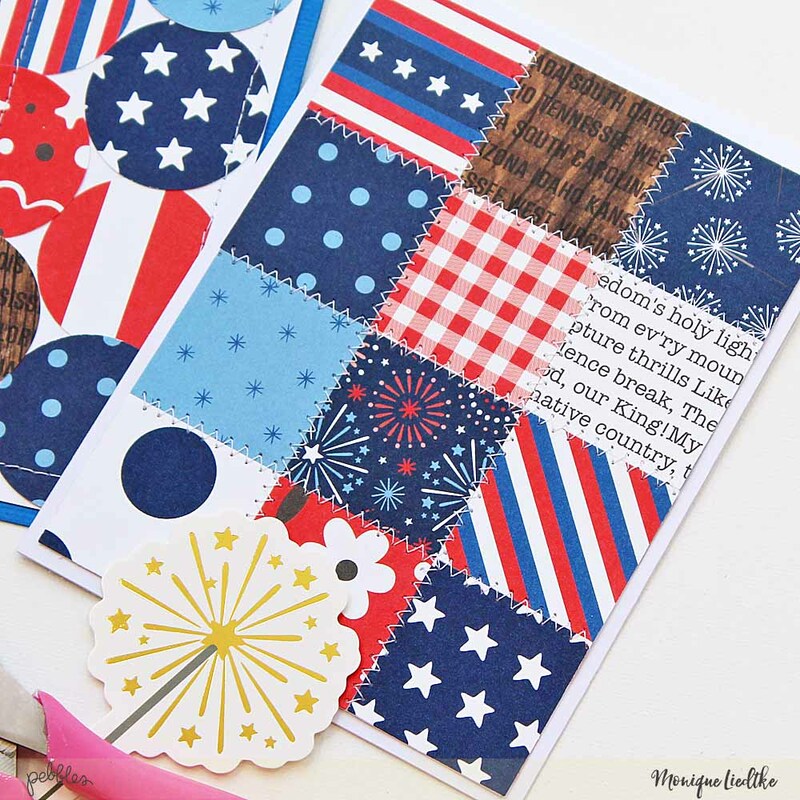 This Memorial Day card set was SO easy to create. 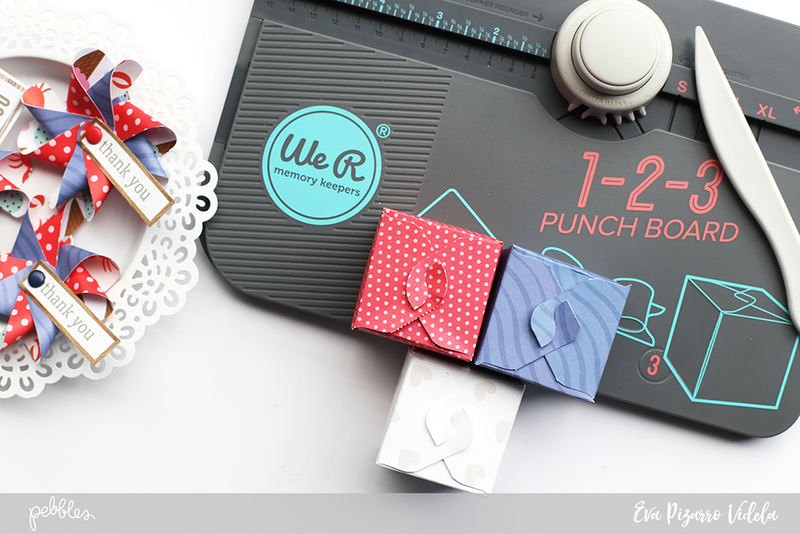 I only used two products from the new collection the washi paper and the ephemera die cuts and some cardstock. 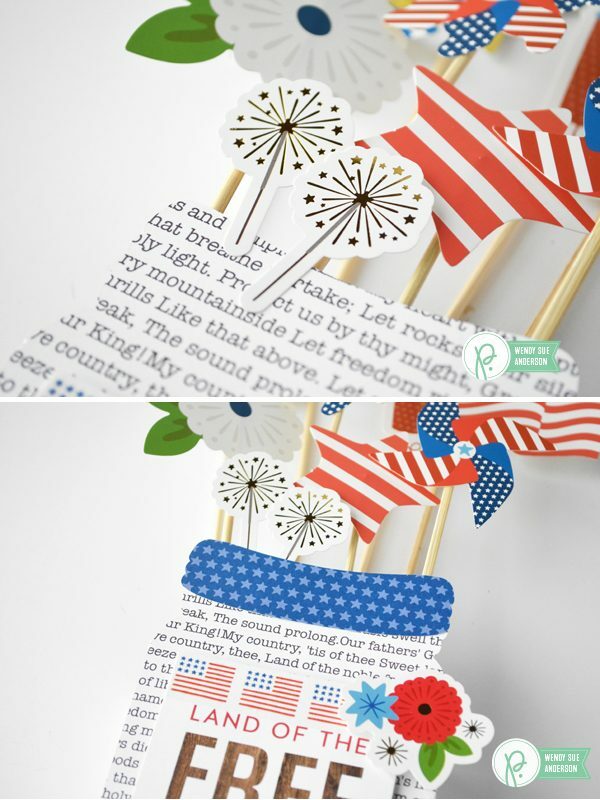 Each card has a few strips of washi paper and a die cut. 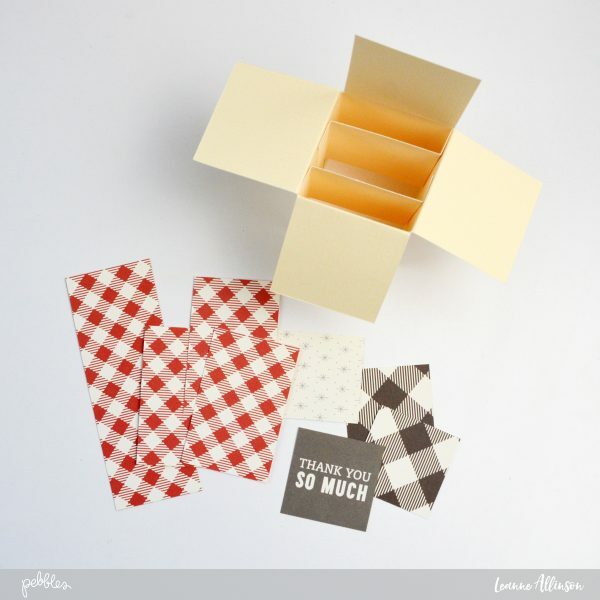 I love that there are so many choices of washi tape in each washi paper booklet. It’s like having 48 different rolls of washi tape. I added buttons to a couple of the cards, tied with twine, of course. 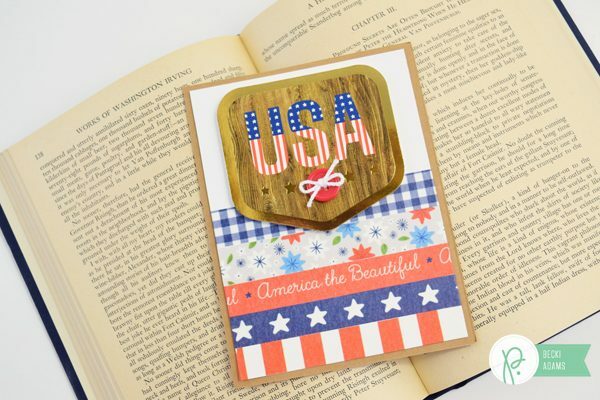 Isn’t that “America the Beautiful” die cut gorgeous? This was the first die cut I grabbed out of the package. I knew I wanted to use it first. The die cuts are adhered with pop dots so they stand out from the background of the card. 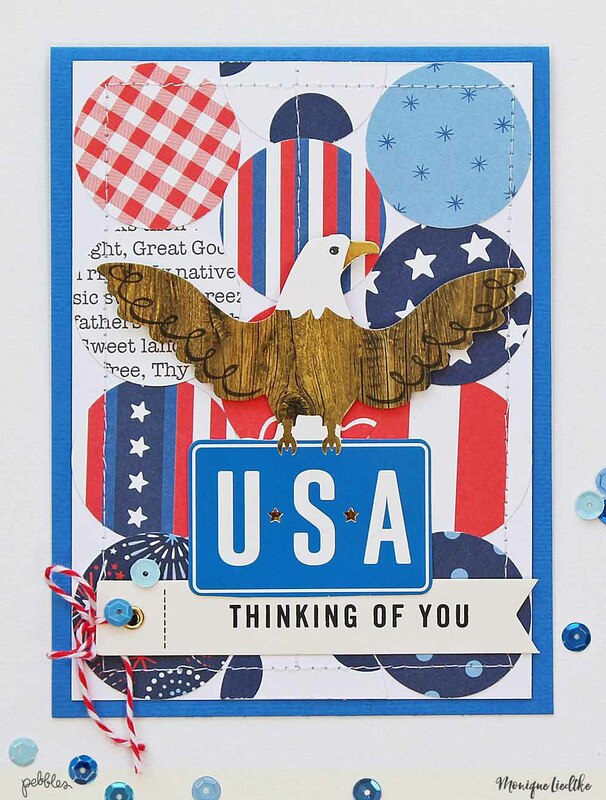 It’s so hard to tell in this photo but there’s a gold border around the “USA” die cut. Metallics are gorgeous but not very easy to photograph. 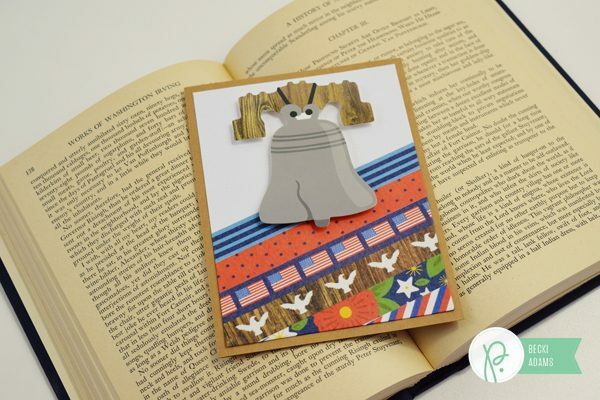 Yes, that is a die cut of the Liberty Bell. Isn’t it adorable? I think this entire card set only took me 30 minutes to create. 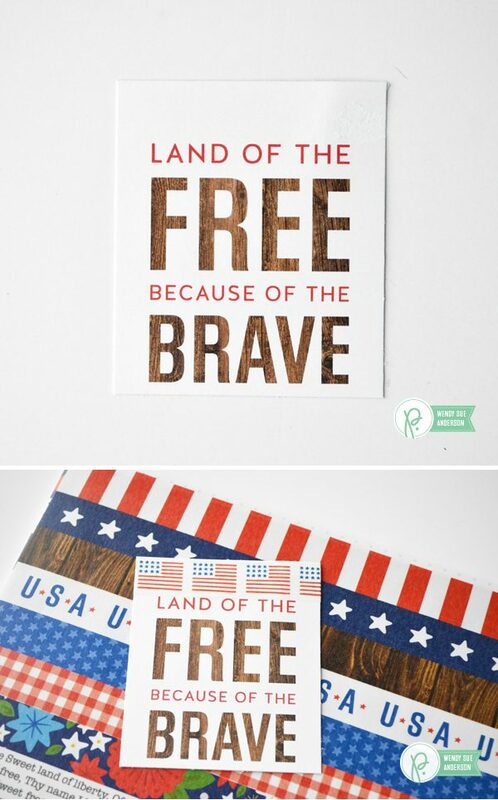 Not only are these cards perfect for Memorial Day but they’re also perfect for the 4th of July as well. I will be creating many more cards with this collection. 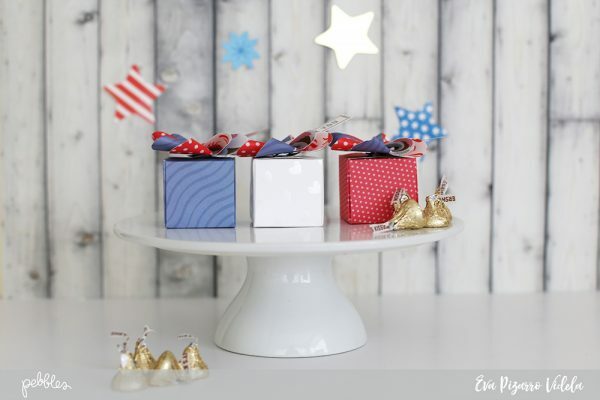 You can never go wrong with a red, white, and blue color scheme for all your Summer projects. 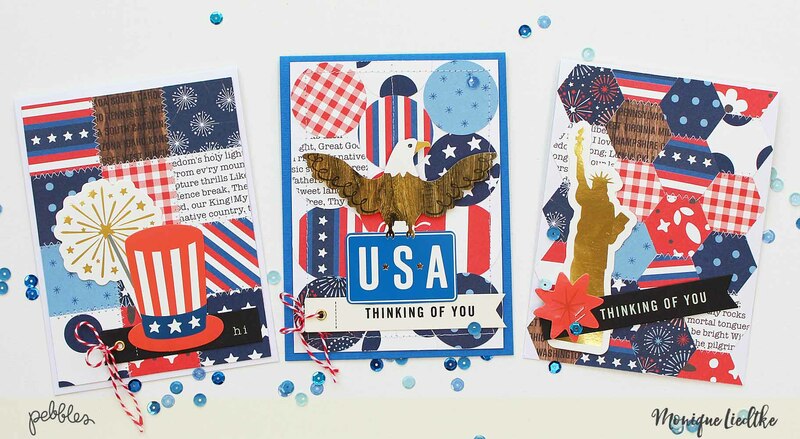 If you like these Memorial Day cards, you’ll love the cards I created last year. 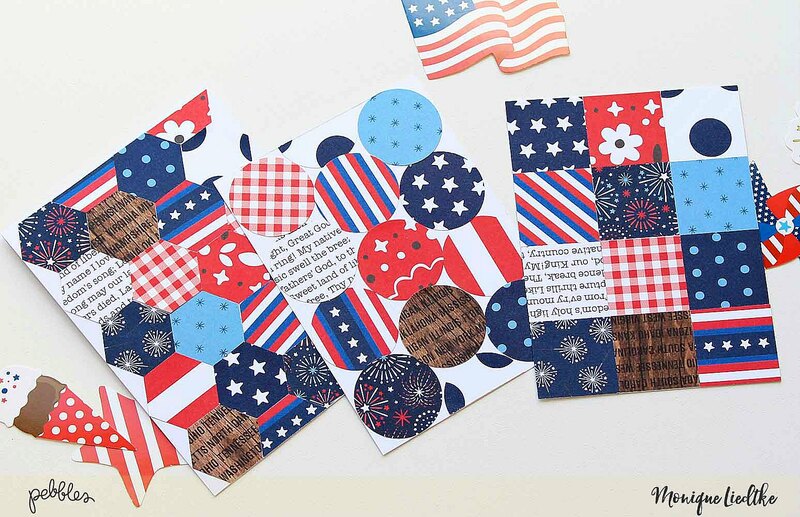 These cards are not in the traditional red, white, and blue color scheme. You can find them HERE. Thanks for stopping by the Pebbles blog today.